The RAF Memorial Flight Official Club Yearbook for 2018 will be sent out exclusively to Club members, free of charge, in the next couple of weeks. The BBMF Yearbook is NOT on sale to the general public. 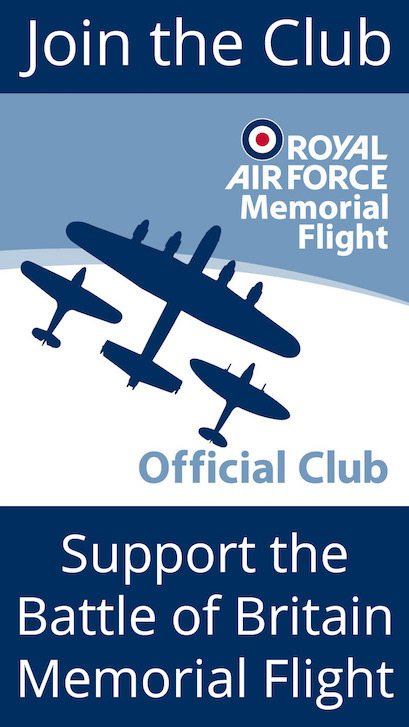 If you are not a member, join the Club today to receive your free copy and all of the twice-yearly BBMF magazines, as well as the monthly e-newsletters with exclusive content for Club members. This year we celebrate the centenary of the Royal Air Force, and this special RAF100 anniversary edition of the Yearbook is another bumper 84-page issue, with many exclusive and compelling features, accompanied by wonderful photographs and artwork. We are honoured to have the Foreword for this Yearbook written especially for us by the head of the Royal Air Force, the Chief of the Air Staff. In keeping with the RAF100 theme, the regular ‘Lest we forget’ feature this time investigates the first ever RAF deaths in action on the very first day that the Service came into existence on 1st April 1918. There is also a brief biopic of the RAF’s first 100 years. 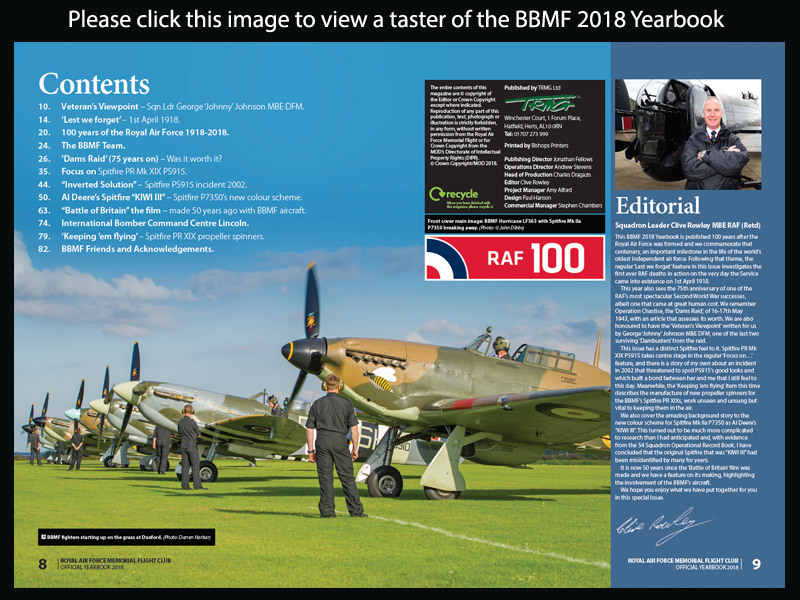 This Yearbook has a distinct Spitfire feel to it, with Spitfire PR Mk XIX PS915 centre stage as the subject of the regular ‘Focus on…’ feature, and the ‘Keeping ’em flying’ item this time describing the work involved in manufacturing new propeller spinners for the BBMF Spitfire PR Mk XIXs. 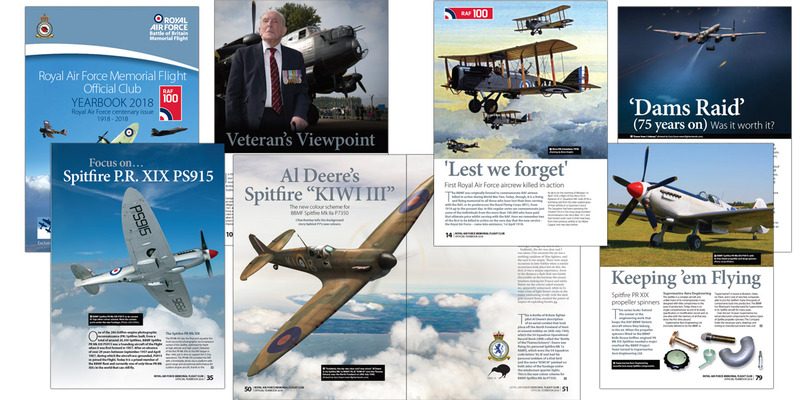 We also cover in detail the background story of the new colour scheme that BBMF Spitfire Mk IIa P7350 will be wearing when it emerges from its ‘major’ servicing later in the year, that of Al Deere’s Battle of Britain “KIWI III”. The contents list for the 2018 Yearbook is below, click on the image to view a few ‘taster’ pages.